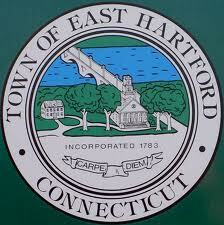 The most accurate East Hartford town map available online. East Hartford (41n47, 72w37 EST) is a town in Hartford County, Connecticut, United States. The population was 51,252 at the 2010 census. East Hartford is home to the headquarters of Pratt & Whitney, part of the United Technologies conglomerate. The manufacturing plant takes up a significant amount of East Hartford's area, and at its peak, it employed tens of thousands of people; however, currently, it only employs about 5,000. East Hartford also contains a Coca-Cola bottling plant, located on Main Street. The city is dotted with various industrial and suburban office parks.